BOP Theatre works to create excellent theatre that brings the stories of disabled people to the stage in accessible and innovative ways. Through our productions we reach a diverse range of people in different places, including rural and international communities. We create an ambitious, respected space to place disabled voices and narratives centre-stage. We strive to make experimental work that is unique, to learn from the results of what we do and to share that learning. We create work for people of all ages and who belong to diverse cultures. As a theatre company with disability at its core, we feel it is important to establish an expectation that we will produce high quality theatre that embodies the principles of Creative Access. We define Creative Access as innovative work that imaginatively embeds a range of tools such as audio description, captioning and sign language from the very beginning of the artistic process. To claim any credibility in promoting access to the wider arts community we have to show that it can be done well, that it adds value to a creative product and that it is desired by audiences. 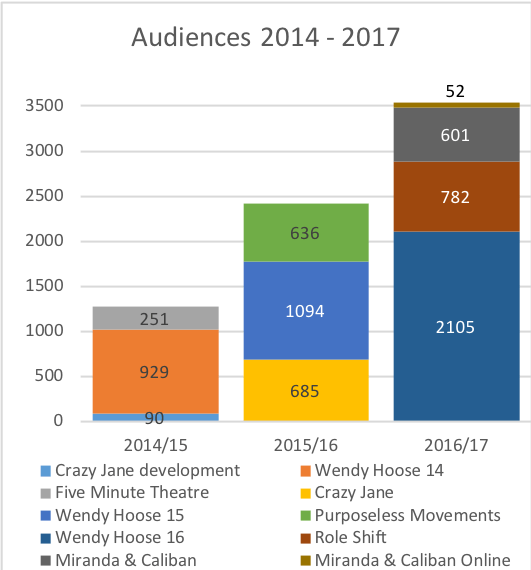 Through our shows we have demonstrated convincingly that Creative Access was not just a way of meeting legal and moral equality obligations, it was something audiences enjoy and that other theatre makers could and should aspire to. Our approach to Creative Access is bespoke for each production, designed to integrate within the show and to add value to it for the whole audience. So how do we do this? Alongside this approach to access, we continue to develop our ‘risky aesthetic’ – putting atypical bodies on stage, which is risky for them and for us – challenging our newly confident audiences with productions that showcased unique voices from the deaf and disabled community. Purposeless Movements (2016) – explored the specific physicality of men with Cerebral Palsy, consciously rejecting traditional movement and theatre styles to create something uniquely their own. The show played to packed out audiences at Tramway, Glasgow, Traverse, Edinburgh and Eden Court Theatre, Inverness – it received two 2016 CATs Nominations for Best Director and Best Ensemble. Role Shift (2016), developed for a Play, Pie and Pint, consciously tackled the role of the BSL interpreter within live theatre – a subject of great interest to the Deaf community – and placed a disabled performer with an atypical body centre stage. Role Shift had a broad popular appeal, playing to audiences at Oran Mor and The Gaiety Ayr. Blanche & Butch (2017) Written as a follow-on from a 2005 hit about disabled drag queens entitled ‘Heelz on Wheelz’, this show with songs joined the queens backstage as they prepare for another performance of ‘Whatever Happened To Baby Jane?’. Hitting on themes of sexuality and aging, the show looked at how our intersectional identities form each of us in to complex beings with commons needs and wants. The Tin Soldier (2017), written by Mike Kenny, was BOP’s first experience of making work for young people. By retelling this classic story of a soldier who some might see as being disabled, we presented disabled performers and characters as role models for all young people today. I thought it was dangerous. A hell of a lot more interesting than the stuff other companies create. Much of the work I see is ordinary. This isn’t ordinary. It is unique and engaging.